Paytm Mall is hosting a Republic Day sale that is scheduled to run till January 26. Let's take a look at the best deals the platform has on Samsung smartphones on day 3 of the sale. Paytm Mall Republic Day sale is live now and will go on till January 26. The e-commerce platform is offering deals on plenty of gadgets including smartphones, laptops, audio accessories and more. 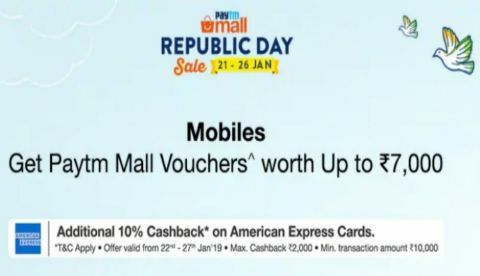 Under the sale, Paytm Mall is running a Samsung carnival in, which they are offering up to Rs 9,000 cash back and giving away up to Rs 3,000 worth Paytm Mall vouchers. So, let’s begin with taking a look at the best Samsung deals that are worth taking into consideration. Samsung’s latest device Galaxy A9 is now up for sale and available on Paytm Mall with a cashback of Rs 1,850 that brings down the price of the smartphone to Rs 35,140. It is the world’s first smartphone that comes with a quad-rear camera setup on the back. Check out the deal here. The Samsung Galaxy S9+ 6GB RAM variant is now available on Paytm Mall at Rs 52,900 including Rs 4,500 cash back. There is also a no-cost EMI option available on this purchase. Check out the deal here. The Samsung Galaxy A8 Star comes with a dual primary camera and a 24MP sensor on the front and can be bought during the sale at a price of Rs 28,490 that includes Paytm Mall Rs 1,500 cash back as well. Check out the deal here. The Samsung Galaxy Note 9 8GB/512GB variant, which was launched in India at an MRP of Rs 93,000 is now available on Paytm Mall at Rs 84,900. Buyers will get an additional Rs 9,000 cash back on this purchase, which brings down the effective price to Rs 75,900. Check out the deal here. The Samsung Galaxy J6 sports a 5.7-inch Super AMOLED display that offers a resolution of 720 x 1480 pixels. The smartphone is equipped with a 13MP sensor at the back and an 8MP sensor on the front. During the sale period, you can grab this device for Rs 9,965 (including cash back). Check out the deal here. What is Force FXAA on Samsung Galaxy Note II?